When applying lining paper or wallpaper you can often find that you have too many tools in your bib and brace overalls. In your pouch your may have your plumb line, sand paper, papering brush and cutting board and stanley knife. 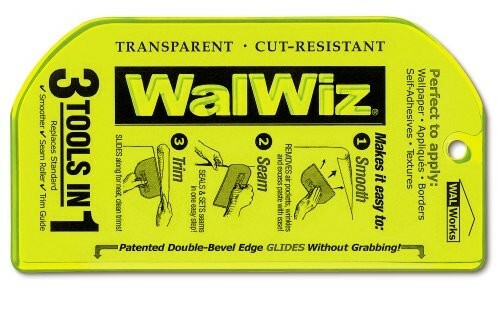 However the Zinsser wallpaper smoother is a 3 in 1 wallpapering tool called the walwiz. This basically elimates your cutting board and papering brush giving you the perfect tool for applying any type of wallpaper. You can also throw out any seam rollers or rubbers as the Zinsser Wallpaper Smoother is smooth enough to be used as a multi tool. It is also made from see-through acrylic which is helpfull when making those difficult cuts to unsure no mistakes are made.